Perhaps these reviewers simply received faulty/lemon units? Internal soldering and construction can vary. On the other hand, both reviews were submitted on Feb 1, 2017 implying their units probably came from the same production batch. There are a couple of recent negative reviews on Amazon.com as well (though not detailed). Of course, it does make one wonder if Tecsun made any internal design changes to the PL-310ET. But again, perhaps these two reviewers simply received units from a faulty batch. For sure, these reviews are not consistent with the excellent performance of the PL-310ET I know–which is, by any standard, an amazing little radio! I don’t want to imply there’s something wrong with the current PL-310ET production run, but I am curious if anyone else has been disappointed with their recently-purchased PL-310ET. Comments? This entry was posted in News, Radios, Shortwave Radio and tagged Dave Zantow (N9EWO), PL-310ET, Tecsun PL-310ET on February 5, 2017 by Thomas. 2. Enabling beeping does work however instead getting beep sound i get buzzing sound. 3. using the ETM in FM was very fast when I first bought the radio, now it takes very long time. Any suggestions or tricks? unfortunately there’s no official service or support in my country. Interesting – the number and specific functions that are affected would seem to suggest the system reference clock is faulty & running ~5x slow. I can’t find a schematic for the PL-310 (just the block diagram in the manual, and the datasheets/appnotes for the Si4734) but it _appears_ to all run just from a single clock – either 32.768kHz, or some multiple of that running the keypad/display CPU & divided down to 32.768kHz to clock the Si chip. A reasonably experienced tech, electronics hobbyist, or even a technically-adept ham should be able to identify the clock source just by looking, & possess the gear to see if the clock signal is present & running at something like a correct frequency. Many thanks, I´ll give it a try, also, this happened after the radio was stored for a week, coudl ths have been caused by temperature? I recently bought another PL310ET having returned a dud (deaf on shortwave). The returned example was from 2016 ,according to the serial no. The replacement was of 2018 and much, much better where sw was concerned! There’s no point in my reviewing such a well reviewed radio. All I have to say it is incredibly sensitive except on Longwave. Will manufacturers please, in future, remember to wind a Longwave coil on their products ferrite rods! I’m sure that they can do that. Some of us here in places like Scotland still like stations like RTE and Radio 4 on LW. The rather fierce AGC takes a bit of getting used to but I would rather have that than no signal at all. Has anyone noticed that the volume control is rather quirky? Volume one is really loud and takes a while to get louder when you try to increase it. I purchased one now in July. And as Vivencio Flores says the AGC is not good, that is my main claim. It should not be that way, really annoying. The bandwidth control is also not so good in the widest mode, but for that price, one cannot expect so much, but the AGC should have been better anyway, is nearly useless. Here”s my experience with a PL-310ET purchased in November of 2016 which I have tested under various conditions for several months now. My main complaint is the annoying volume pumping on strong stations on speech modulation peaks both on medium wave and shortwave. I figure this may perhaps be due to a too responsive AGC. I found that by tuning 1 Khz off up or down the center frequency of the received station the volume pumping is eliminated, however with a significant drop in overall audio level. I thought perhaps I had just gotten a defective unit, but a PL-380 purchased just in March of 2017 also exhibits the same volume pumping. On stations with relatively steady modulation (audio compression/limiting) this is not a problem. I hope Tecsun corrects this in their future production batches. Otherwise, both radios are top-notch receivers. For best shortwave reception I connect to an external antenna as the built-in whip does not do a good job at receiving weak signals at my location in the central Philippines. I have just taken receipt of a 310 today. I hooked it up to my external antenna (half size window) and I have to say I was disappointed considering the rave reviews. It appears to overload very easily but OK on the internal whip. MW however is superb. So perhaps mine is from a poor batch too and I need to get back to Anna at anon-co. I have watched Clints video amongst others who have praised the 310 so I am a little surprised by my findings. Further testing required. Honestly, I would only judge the 310ET based on what it does with the whip antenna. It’s a small portable and they’re just not as well equipped to handle any sort of largish external antenna. Of course, I believe Clint has had very good luck with it hooked up to one. Tom Brogan also used it on a long wire and found good results so I’m a bit puzzled. I have emailed Anna this morning and will await her reply. Hi there, I’m not so surprised this receiver has been given a bad review or two on eHam.net. A written summary of the effectiveness of a radio receiver is, by it’s very nature, subjective. Unless you’re presenting hard evidence that a certain feature is not up to specification, then it’s always going to be open to interpretation. Empircal evidence in the form of measured performance is best of course, but if that’s not possible, then evidence in the form of a recording of a signal (or signals) is very useful. I have tested the PL-310ET with longwires, an 800 ft barbed wire fence and an ALA1530. Using these various antennas I have heard and recorded, KCBS Pyongyang, ABC Northern Territories, Zambia NBC Radio 1, Bangladesh Betar, Radio Guinea, Radio Fana, RTM Sarawak, Radio Nacional Brasilia, amongst many others. Intentionally, the stations I’ve listed here aren’t the easiest signals to hear on shortwave, in fact some of them are quite difficult to copy on a high-end portable. So, what can we conclude? Fundamentally there is clearly nothing wrong with the design of the PL-310ET. In fact, for the very modest price, it’s a brilliant radio; I can’t think of a better portable in terms of performance as a function of price. Poor reviews such as those highlighted have to be down to either a bad manufacturing batch – and I run a manufacturing company, so I know all about poor yield – it happens. Or, for whatever reason, the user hasn’t managed to extract the best performance out of their radio. 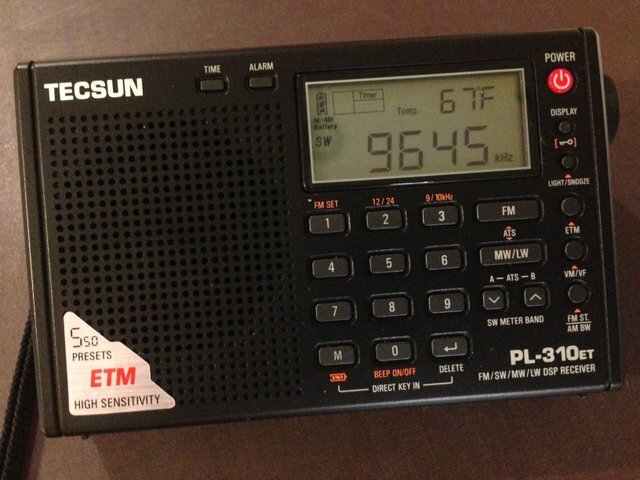 Thomas Brogan was spot on when he stated that the PL-310ET is actually a better-built radio than some of Tecsun’s more expensive models and rather untypically for a Chinese manufactured radio, actually feels like a quality product. Mine is certainly superior to the PL-680 I previously owned; that radio started falling apart straight out of the box. Whenever I’m asked (and it happens quite frequently), I always strongly recommend the PL-310ET as a budget portable that capable of real DX. I don’t want to sound like a sinophobic grampa but I’ve had a big enough share of DOA and. Die-too-soon events with chinese made electronics to get the impression that QC is stilan issue. Tecsun is no exception – the first PL-660 I got stopped tuning after a few weeks, after a year the replacement. unit developed an unhealthy static build-up when it’s running for a while and now the antenna jack starts failing after using it like 10 times – a typical issue. 8’d be happy to pay more money for better quality and better reliability, but even if I pay a lot more, like for my chinese made Alinco, still getting failing encoders, failing jacks and a first unit being even more defective than the replacement. Regarding the eham reviews, take them with a pinch of salt, true, there may have been QC issues but the second review giving a 1 out of 5 rating which is very harsh indeed. Yes, MW is not the best but shortwave is superb and you are not going to get Hi-Fi quality from a 2 inch speaker. Overall a cracking portable radio IMHO. Thank you all for your comments! I just added a note to this post regarding the positive experience from you all. Sounds like your PL-310ETs are forming as expected. The PL-310ET is a brilliant little radio for travel. I take it or the CC Skywave or the ICF-SW100 with me on all trips. I ordered mine from Amazon shortly before Christmas 2016 (December 23) based on all the positive descriptions of it on your site, and I am very pleased with this radio. Very well made (I accidentally knocked it to the floor without any ill effects), excellent sensitivity, especially on FM, and great sound from a small speaker. The PL-310ET is a great radio for the price. The si4734 DSP chip is the winner and provides selectable bandwidths to limit co-channel interference with great sensitivity. The Easy Tune feature is actually very useful, especially if you move about a lot for business. I have a Pl 310 ET, and its an excellent little radio and as to the comment about build quality it’s actually better made than some of the pricier Tecsun models, actually you only need to watch the very comprehensive in depth series of video’s from your very own Oxford Shortwave Log. Actually i don’t believe anyone else who has went into as much detail on this little radio, watch some of his videos on this little radio and you will be amazed. Let’s face it this guy has been out in the woods putting this radio to the test. 73 Thomas. Hi, Thomas–I totally agree. The PL-310ET is an amazing little DX machine! Clint has certainly put it to the test. I think what I’m asking about are those who’ve recently purchased the 310ET (in 2017) to determine if there’s simply a bad batch being sold. I received my Tecsun PL-310ET just before Christmas and have found it to perform as good as the majority of reviewers stated. It receives as good or better than my venerable Sangean ATS-3A on all bands. Lets face it, the audio on the tiny speaker will never rival the larger sets, however it is quite adequate for most shortwave listening. I really like the ETM scanning function and use it to guide my listening on the desktop units which lack that function. Perhaps the reviewers got a defective unit or rough handling loosened or broke some connections. I am very happy with mine. That’s good news. Where did you order your 310ET? I ordered it from Amazon a week before Christmas so it came from stock that was in Amazon’s warehouse. No clues as to production date but I would guess it was recently made. I just checked the radio again and found a serial number? under the flip out stand. It is 41620161C01500. This might give a clue to manufacture date or batch.